Home / Fanboying! • Q and A • Suddenly Susan / Christian Bale Goodness! Susan Meets Batman Himself Low Key And He Made Her Fangirl Week! Autographs! And More! There are days, when you love going out and meeting people… And of course others when… That’s not the case. 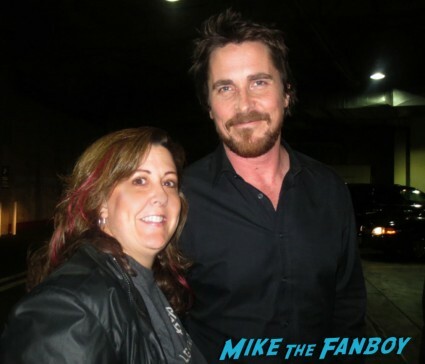 Fortunately, Susan was able to meet Batman himself, Mr. Christian Bale, super low key and with only 8 people waiting. NICE! I know how excited she was and I’m so glad it all worked out for her! There are some days when it’s just awesome being a fangirl! Last night there was a screening and Q&A for Out of the Furnace, starring Christian Bale, Casey Affleck, and Zoe Saldana. I am a huge fan of Mr. Bale’s work and I’ve tried many times to get his autograph. Either he didn’t show, or there were 10,000 people waiting, or any of the usual trappings of the autograph fail – take your pick. My hopes this night were sort of in the middle – there would either be a huge crowd again, or nobody at all – that’s the usual 50/50 shot when it comes to someone of his caliber, so I left the house and headed out, not expecting much. Boy was I wrong!! After making a quick decision where to wait, as there were several possible drop-off points, I waited maybe five minutes with 8 other people and the drops started. First was Zoe Saldana. 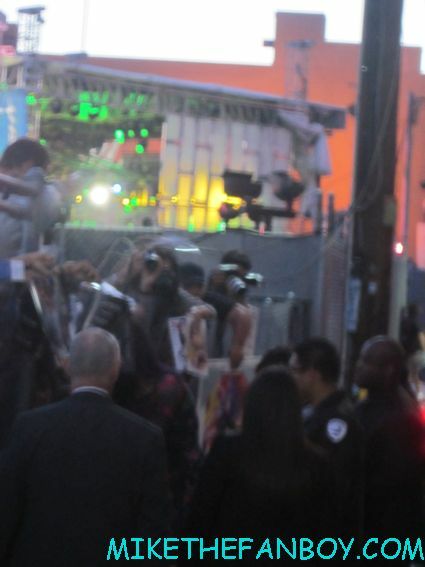 She signed 3 autographs and took one photo, but they whisked her away. I had my Avatar Blu-Ray cover in case, but I wasn’t able to get her. No matter. I had my sights set on someone much bigger. About 2 minutes after Zoe, a large SUV pulled up. I couldn’t see who got out, but I heard people start saying “Christian, will you sign”. People shuffled and got their items ready. He came right over. There was a small semi-circle of just 8 people. I had heard the security at this venue was a nightmare, but the guys were being very cool and accommodating. They were blocking us from traffic so no one got hurt, but I couldn’t seem to find a spot. I went to the right – blocked by a wall. I went to the left – blocked by a security guard. I stood behind everyone – you can’t see me waiting at 5 feet tall. I was panicking. 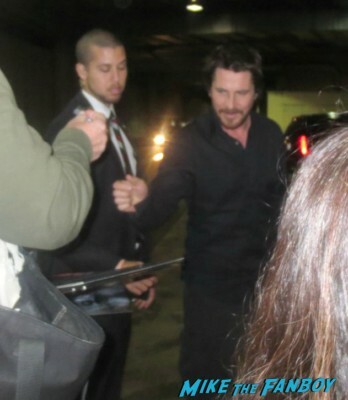 Was I really going to miss out on Christian Bale with just 9 people waiting?!!! Then, I caught a break. A guy who got what he wanted stepped back and I slipped into his spot. Thanks kind stranger! I put my Empire of the Sun mini poster in front of him and Christian asked, “who’s this to,” and then sort of said my name as he was spelling it out. So awesome. 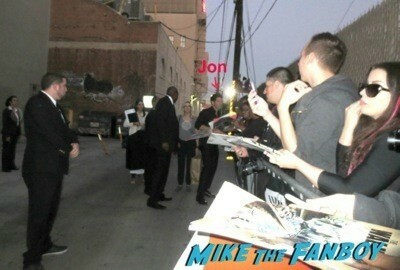 I saw that people were asking for photos and he was accommodating. I always thought he was not a photo op guy, but I certainly jumped in for my chance. A nice woman took my camera and snapped the shot for me. Thanks again!! I was the last photo and they took Christian away. We all thanked him again and again. He was soooo nice! Smiling the whole time and responding with an “of course,” or “you bet,” when someone asked to take a photo with him. Super, super cool guy. I love that he personalizes everything. I honestly think he is less trying to ruin dealer’s sales and more wanting to know your name and give his fans something special. I was the only person without a Batman item to get signed. I liked the first two movies, but hated the third. There are so many other performances that I think Christian is just top notch in and Empire of the Sun is one of them. It’s a favorite movie of mine and what an amazing performance from a 14 year old Christian (or any 14 year old I’ve ever seen). If only every encounter was this easy, this calm, this awesome!! Oh, and how about an MTF contest where people try to decipher the word Christian wrote after my name? I’d love to know. Throwback Thurs! 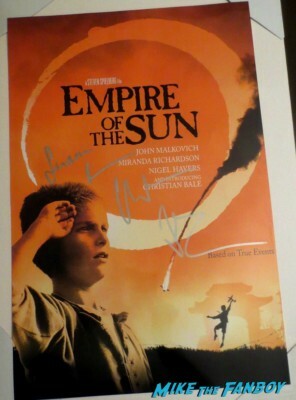 Meeting Emma Thompson And Colin Farrell! Saving Mr. Banks Q And A! Autographs! And More! Throwback Thurs! Meeting Kong Star Tom Hiddleston! The Night Manager Q And A! With Elizabeth Debicki! With Hugh Laurie! And More! Awesome! Congrats! I love him. He’s so nice. It probably says “Regards” after your name. He signs most with that. Congrats! It definitely looks like an ‘R’ – thanks Jade!! Right on! Glad it was a great success!